John Collins is the kind of rookie you constantly need, no, want to keep your eye on. The Atlanta Hawks power forward is quickly making an impact, bouncing along multiple trajectories that all lead to one place: NBA star status. Sure, that may be a year or two down the line, but the 20-year-old Wake Forest alum has established an impressive (and entertaining) reputation on the court thanks in part to his gnarly dunks, formidable defensive skills, and boundless athleticism. He also has a certain kind of swagger and undeniable confidence that he carries off the court. In short: Collins embodies everything we look for in a Express NBA Game Changer. 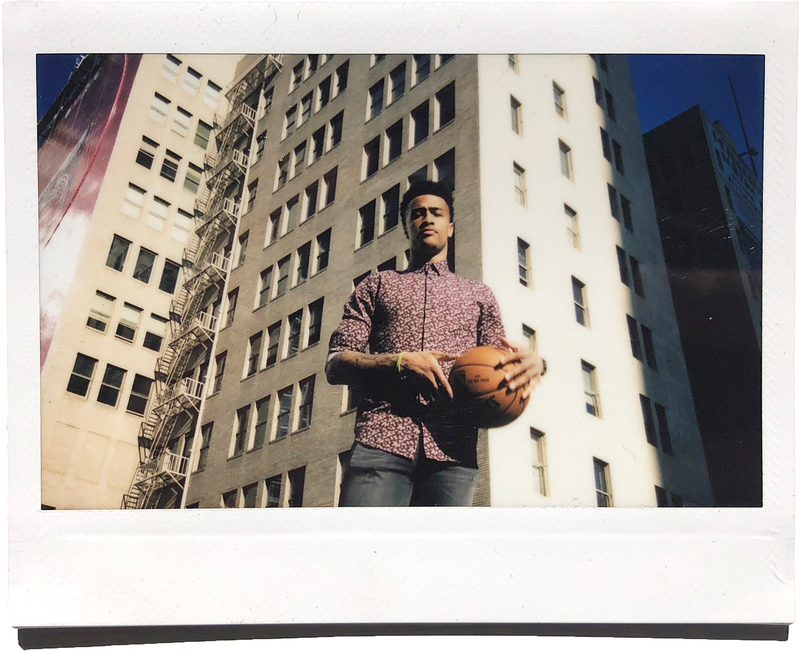 He may have already schooled us once on suiting up, but we caught up with Collins at the Express VIP Suite in Los Angeles during NBA All-Star 2018 to talk pre-game jitters, podcasts, and his biggest style mistake. How does it feel to be in L.A. for NBA All-Star 2018? It feels good, man. The weather is nice. I had my game yesterday. It’s a dope experience. So what’s your favorite thing to do while you’re in town? Literally just enjoying my time in L.A. I really enjoy the city, especially right now during All-Star. I’ve always loved the coast, the vibe. Tell me about the going up against Team World in the Mtn Dew Kickstart Rising Stars game. Team World beat the heck out of us–props to them. It was a fun game, though. The chance to go out there and play against a bunch of other young guys is cool. We had a fun time. I had some good dunks. Obviously, I don’t like to lose, but hopefully I’ll have another chance to come back next year and redeem. What was going through your mind walking onto the court? I just wanted to go out there and have fun. I was a little bit excited, a little bit nervous. I was all about going out there and having a good time and putting on a show. Do you still get nervous before game day during the season? I do get a little nervous during the season before games, but just for a couple of minutes. As soon as I step onto the court, that nervousness is gone. There might be times where I’m overthinking it. I just try to calm myself down, and it’s all good. What’s your go-to track to psych yourself up? I actually kinda psych myself down. I’ll watch my TV shows or listen to a podcast. I’m a big Naruto guy, so I might watch some Naruto: Shippuden before a game. This might be the first time someone has said they listen to a podcast before a game. Which one do you listen to? I like “The Brilliant Idiots” with Charlamagne Tha God and Andrew Shulz. That’s my go-to podcast. If you weren’t playing basketball, what do you think you’d be doing? I think I would be some type of analyst or something in the communications field–maybe a sideline reporter or analyst. I’m all about good conversation, and I think I could put that to good use in journalism–perhaps that’s something I’ll pursue post-career. 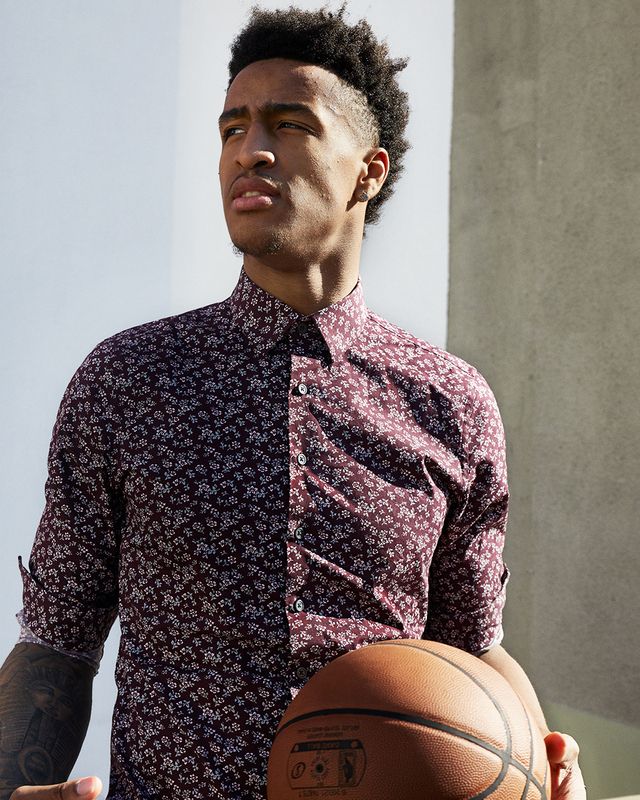 Let’s shift gears to style. How would you say your personal style has changed over the years and the season. It’s evolved tenfold, especially being able to work with Express. I went from high school where I was wearing uniforms daily to college where I was able to expand my wardrobe a little bit to the NBA where every time I step out it’s like a fashion show for us players. So, I always gotta stay fresh. Has working with Express helped up your personal game? Are there any new looks that you’ve been rocking lately? I love wearing the dress shirt and sport coat–they’re perfect for special events. Now I’m wearing them just to wear it because Express is tailored just for me. And . . . if I must say I look really good in it, right? So why not wear it? Is the floral shirt a new development? No, I love florals. It’s kinda funny because I like to wear all black a lot, but I love the wilder stuff, too. 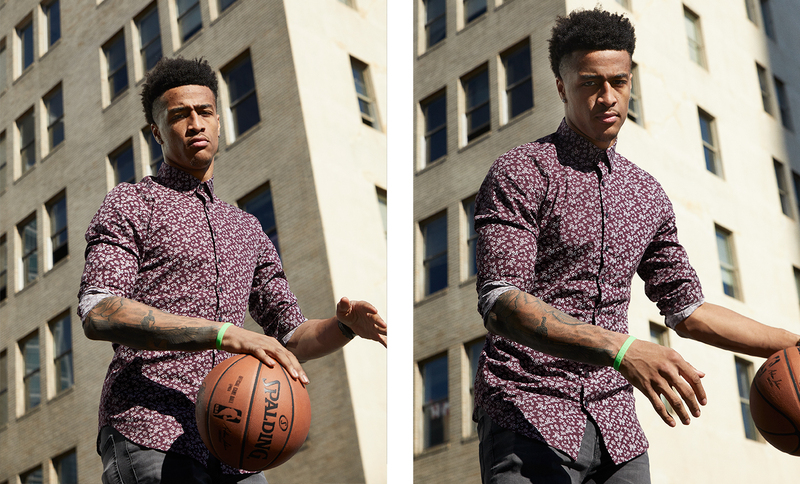 We’ve seen you walking through the tunnel this season in some great Express outfits. What’s been your favorite? My favorite Express ‘fit was the long camel coat with some nice skinny jeans. I just like that jacket, the way it fits, especially as a taller guy. What’s the biggest style mistake you’ve made? I’d say my biggest style mistake was not caring about style. I would kind of say to myself, ‘it is what it is.” Obviously, I’m not saying appearances are everything, but appearances can create lasting impressions. Sometimes you want to look good to feel good. I didn’t realize how important that could be for overall confidence. Everyone says the tunnel is the new runway . . .
How do you go about planning your tunnel outfits? There are two ways: I either don’t go in at all, or I go all out. If you wear something that’s bland, no one is going to notice. But when you show out, cameras start flashing. If I want to do something crazy, I’ll be really crazy. If I’m not feeling like I want to do that, I’ll just throw on something cool and blend in with the other guys. Do you guys try to out dress each other? We absolutely compete off the court–guys even say to one another “My ‘fit is better than yours”. There’s always competition–guys saying I have this jacket, I have that coat. I turn around and say, listen guys I have 15-16 great Express sport coats and button-ups in my closet so you don’t want to do that. What’s your advice for future NBA All-Star hopefuls? If you’re trying to make NBA All-Star, like I am one day, you have to keep working at your goals. Nothing should be taken for granted. Stay hungry though and you will achieve that dream, but you just have to want it enough.